Finding or suspecting that mold is in your home can be quite stressful. Especially with the fact that it can cause health problems for you and your family. Plus, it also can cause heavy damage to surfaces and furniture in your home as well. In this article we’ve answered a few of the most common questions that you may have about mold. This information has been brought to you by Nashville Water And Mold Remediation Services. And if you have any questions about mold, or if you need your property inspected for it, please give them a call today at (615)348-4003. Mold is a type fungi that can be found both inside and outside. There are tens of thousands or more species of mold. But no one knows for sure exactly how many species of mold exist. Mold grows the best in damp, humid and warm conditions. And it spreads quite quickly by making spores. The spores that it creates can survive some of the most extreme environmental conditions. Including dry conditions that normal mold growth couldn’t survive. What Are Some Of The More Common Types Of Molds? A food source such as, decomposing animals, wood, soil, paper, leaves, etc. A source of moisture, such as would be found in a nice humid and damp basement. And a place to grow, which would be pretty much anywhere that is warm. Since mold cannot produce it’s own food, it gets food by absorbing minerals, moisture, and sugar from plants, animals or decomposing matter. And it’s quite parasitic in nature. What it touches, it destroys. And it can be found outside in damp areas that have shade. Or areas where leaves and/or vegetation may be decomposing. Some people are a lot more sensitive to mold than others. And for them mold exposure may cause symptoms that resemble Hay Fever such as, eye irritation, stuffy nose, skin irritation and also wheezing. But for people that have serious allergies to mold, they may have more severe reactions. And those reactions may include shortness of breath and fever. How Can We Decrease Our Exposure To Mold? If you are sensitive to mold, you should avoid areas that are most likely to contain some sort of mold. And those areas include, but are not limited to wooded areas, compost piles, cut grass, moist mulch, moist soil, etc. How Can We Keep Mold Under Control? 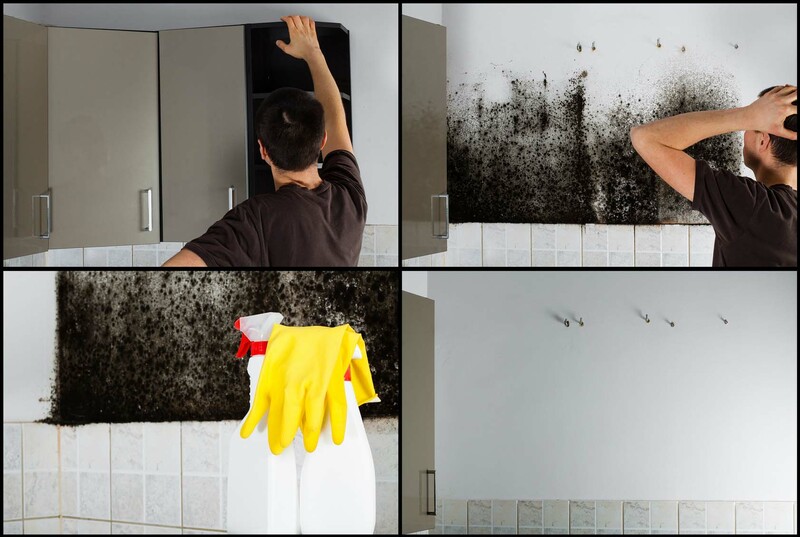 There are many products on the market that will help you in removing mold and cleaning up the damage that it causes. But since mold needs food and moisture to live and grow, the best place to start is with the humidity level in your home or place of business. And you can do that by utilizing an adequate air conditioner, or a good de-humidifier. The objective is to maintain a relative indoor humidity level that is below 50%. Maintaining adequate ventilation in your home is another technique that you can utilize to control mold growth. Allowing fresh air into your home and limiting the clutter from furniture that is close to the walls will help in reducing mold growth substantially. Next, since mold also needs a source of food, try to limit what it feeds on best such as wooden furniture and cardboard boxes. Plastic, glass and metal enclosures are an excellent alternative. Next, consider investing in moisture resistant drywall or paint in areas of your home that have a tenancy to stay humid. Routinely clean away dust and disinfect surfaces that mold feeds on. Make sure to inspect your property after heavy storms, torrential rains, and also snow that has melted after the winter cold. If you suspect that you have a mold problem in your home, or if you have any questions about mold and/or it’s removal, give Nashville Water And Mold Remediation Services a call today at (615)348-4003.